The Logitech UE Mini Boom is considered to be the baby brother to the popular tube shaped UE Boom. The Mini boom was launched with ultra portability, great performance and an excellent price point in mind. Lets see if the UE Mini boom lives up to its popular and Excellent performing big brother the UE Boom. The Mini Boom has a very elegant and minimalist look to it. The speaker is wrapped in a nice thick layer of rubber polymer. In the front and the back you will find the speaker is covered with a metal mesh. The UE Mini Boom comes in all the colors of the rainbow. The speaker has a dimension of 3.4 x 3 x 7.8 inches and a weight of 1.3 pounds which is quite heavy considering the size of the speaker but we felt the hefty weight gave it a quality solid feel. The UE Mini Booms main controls are large and easy to see and are carved into the rubberized polymer. The main controls are located on top of the speaker and have a nice feedback when pushed. The main controls are your volume up and down and in between you will find the Bluetooth pairing button. Additionally there is a small hole in place for the mic. On the back you will find a conveniently placed power on/off switch next to a power LED, Micro USB input and a 3.5mm Aux input. The Mini Boom is very feature packed as well being able to pair through NFC, the Bluetooth range is confirmed at around 50ft which is impressive. Additionally you can pair two devices at one time, and you also have the ability to pair up with another Mini Boom for a more immerse sound experience. Battery life is an estimated 10 hours which is on par with the size of the speaker. Audio is handled with two 1 active drivers in front. To be able to produce some low end sound Logitech had to design a passive bass radiator plate which sits on the top and releases sound through the slit located in the back of the speaker. The Mini Boom pulls of some impressive sound. We where really surprised at how dynamic this small speaker really is, producing very clear and crisp sound. The Midrange is warm and smooth and highs are light and clean making the combination a very pleasant sound experience. We where also impressed by the lower end action as well as we didn’t expect to hear any lower end sound coming out of this speaker but we where wrong. The speaker did not distort at all and was able to contain itself during heavy bass music testing at full volume. Overall we dont think anything else compares in sound to size ratio to the Mini Boom and we think it would be hard to find a speaker with this kind of audio performance at this price. The Oontz Angle is comparative in size and not to say its a bad speaker but the sound feels light and empty compared with the Mini Boom but price wise, the Oontz angle wins. 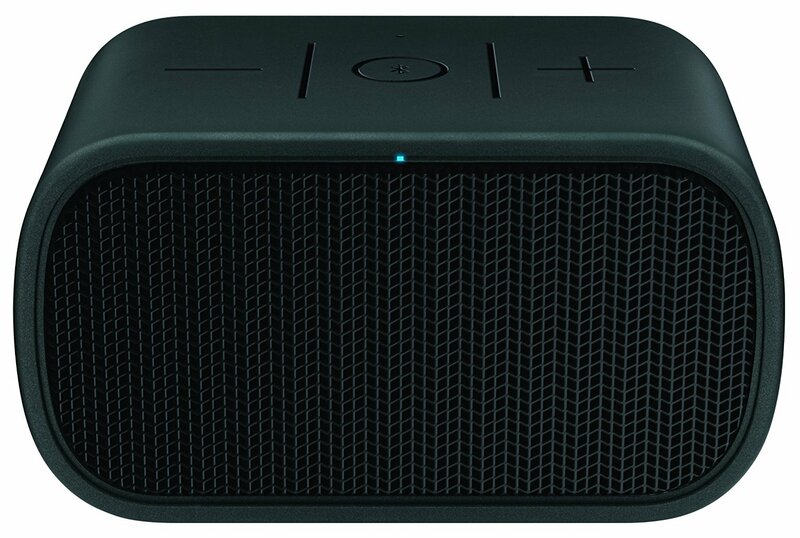 Logitech has managed to pull of another excellent Bluetooth speaker. The UE Mini Boom is feature packed and offers a very pleasant sound experience and the main attraction to consumers would be the price point starting at $50-$150 from Amazon.com.